Lodge Cast Iron recently celebrated 120 years of producing quality cookware right here in South Pittsburg. Fig1. – l to r: Derrald Beck, Henry Lodge, Gary England, Ginger England. As part of their Anniversary Celebration Lodge produced 120 120th Anniversary Edition skillets, and auctioned them to the highest bidder. The money raised via the auction was divided equally between their three favorite Marion County Charities: Marion County Children’s Fund, Marion County Food Bank, and Marion County Good Neighbors. The auction raised in excess of $25,300.00. 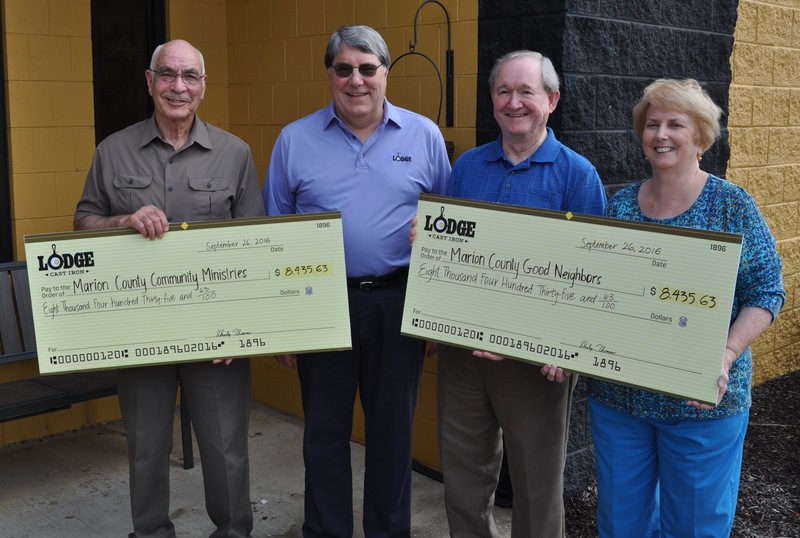 On September 26, 2016, at the Lodge Factory Store in South Pittsburg, Henry Lodge, Lodge CEO, shown in the picture above, presented two checks, each in the amount of $8,435.63, to Derrald Beck, MCCM Board President, Gary England, MCCM Board Vice-President, and Ginger England, MCCM Operations Manager. Lodge is an amazing corporate citizen of Marion County. We are honored that they value our work at MCCM and we are grateful for their generosity. Thank you Henry Lodge, Bob Kellermann, and all of the wonderful employees of Lodge Cast Iron.